Context, organizer of critically walking tours, is celebrating Black History Month with the creation of a new walk focusing on the history of African Americans in Boston. Led by a public historian and former director of operations at Boston’s Museum of African American History, the walk covers the area from the North End to Beacon Hill, including stops at seminal places such as the Copp’s Hill Burying Ground and the African Meeting House. The discussion will evolve from the arrival of the first enslaved Africans in Boston in the early 17th century and will culminate with their struggle for freedom and civil rights and eventual suffrage victory in the late 19th century. Black Boston: Freedom in the Empire and the Republic, launching in February, draws upon the expertise of Context’s network in Boston, which includes historians, journalists and social historians. As with all of Context’s programs, groups are limited to six people. Black Boston runs Tuesday to Saturday at 10 am and 1 pm as group walks ($65 per person). Private groups can be scheduled upon request ($300 flat fee). Founded by National Geographic writer Paul Bennett and graphic designer Lani Bevacqua, Context is a network of English-speaking scholars and professionals, including art historians, writers, architects and gastronomes, who organize and lead walking seminars in eighteen world cities, including: Florence, Rome, Venice, Naples, Paris, London, Edinburgh, Madrid, Barcelona, Berlin, New York, Philadelphia, Boston, Washington, D.C., Istanbul, and Athens. A certified B Corporation, Context Travel was named one of the fastest growing American companies in 2011 by Inc Magazine. Travel + Leisure has called Context one of the top European tour companies for its innovative approach to travel and the depth of its programs. To learn more about Context, visit its website at: http://www.contexttravel.com. Travelers can win a “vacation of a lifetime” with a new contest from Select Registry Distinguished Inns of North America. The grand prize winner will be entitled to a free night stay at each of the nearly 350 inns and B&B’s in the Select Registry™ portfolio for a full year. “It’s a dream vacation – an opportunity to explore exciting new places and visit family and friends, with complimentary accommodations at the most celebrated inns and bed and breakfasts throughout the U.S. and Canada,” says Will Carlson, executive director, Select Registry. To enter the Vacation Of A Lifetime Contest, you register with the Select Registry Golden Quill Loyalty Program at http://www.SelectRegistry.com/GoldenQuill. After that, each of your qualified Golden Quill nights throughout 2012 will count as an additional entry. One grand prize winner will be entitled to a free night’s lodging at each of the nearly 350 Select Registry inns, B&Bs and boutique hotels throughout North America, redeemable for a full year. Additionally, three first-place winners each will get a $500 Select Registry Gift Certificate good at all the portfolio’s properties. Five second-place winners will each receive a $250 Select Registry Gift Certificate. Select Registry’s Vacation Of A Lifetime Contest is open to travelers ages 18 years of age and older in the U.S. and Canada. The promotion ends midnight EST, Dec. 31, 2012, and winners will be announced in early 2013. Only 350 inns in North America have earned this designation, passing rigorous inspections to gain and then maintain membership. Former Vacation of a Lifetime winner Lee Willson traveled with his wife, Joyce, from their home in Washington to Select Registry inns in that state as well as in Arizona, California, Florida, Maine, Maryland, Massachusetts, New Hampshire, New Jersey, New Mexico, North Carolina, Oregon, Pennsylvania, South Carolina, Vermont, Virginia, Washington D.C. and British Columbia. “We stayed at amazing inns in cities and towns where we have friends and relatives,” Willson explains. “Joyce and I like regional cooking and things that are local and unique. We sampled fantastic regional cuisine from the Pacific Northwest all the way to New Orleans and Charleston, and we got our recommendations from the Select Registry innkeepers. Select Registry is a collection of North America’s premier inns. Member properties must pass rigorous, unannounced quality inspections to gain and maintain admission to this elite portfolio. Many of the inns are recipients of coveted industry awards for both service and ambiance, including: Best Small Hotels in the U.S., Top Ten Romantic Inns, Best Breakfast in America, Best Places To Watch the Sun Set, and World’s Best Adventure Lodges. Only 350 of the 20,000 inns and bed and breakfasts in North America have qualified to join this “best-of-the-best” collection. To explore Select Registry inns across North America, visit http://www.selectregistry.com. Contiki Vacations (www.contiki.com) is launching an innovative new online game, This Way to Amazing (www.contiki.com/amazing). Beginning February 15, 2012, Contiki is giving away a European tour every week for a month to the follower clever enough to find the youth brand’s travelers in four of Europe’s hottest destinations. Follow along as the Contiki team posts video clues featuring adventurous Contiki nomads exploring the sights, sounds and backstreets of Europe. Mixing video with Google Maps and Street View, the game allows users to hunt for these travelers’ locations and enter for a chance to win. Each week will feature a different person to follow as they explore a new city, uncovering the local and authentic experiences discovered on a Contiki trip. Once a user tracks down one of the Contiki travelers, they will automatically be entered to win a European trip for themselves, with the opportunity to check out some of the amazing locations live featured in the game. The game integrates the hottest music from up-and-coming artists to keep users entertained as they digitally weave their way through European streets. The Contiki crew also know how much their demographic looks for the latest in food, fashion, music and lifestyle, so the game includes the most current trends and styles. Fans vying for a chance to win can ensure they don’t miss out on the video clues by following any of Contiki’s social media platforms to get reminders. Simply visit Contiki on Facebook, Twitter (: @Contiki_US), Google+, Pinterest or Foursquare to get the most up-to-date news on the contest. 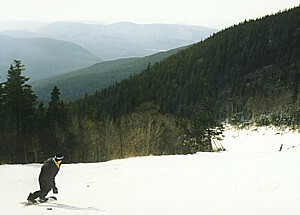 Snowboarding at Waterville Valley. New Hampshire ski resorts now have a deep base of snow for skiing and riding, and special deals and events for the February vacation © 2012 Karen Rubin/news-photos-features.com. The slow snow start of the 2011-12 ski season is now a distant memory with a deep base of snow statewide. The upcoming February school vacation weeks offer kids and families of all ages an opportunity to enjoy the fun part of winter along with special events at the state’s ski resorts. Thanks to intense snowmaking efforts over the past three months, New Hampshire’s ski areas have made the most of a winter that has brought below-normal snowfall totals to most of the United States. Although many New England residents have bare ground in their yards, most of New Hampshire has natural snow on the ground and alpine areas have enhanced natural snowfall with hundreds of hours of snowmaking. As a result, not only are the downhill conditions surprisingly good, most of New Hampshire’s cross country ski areas are also open with over 450 kilometers of trails available. “It’s very easy to look out your window at home and assume that the ski areas may not have much snow, which really is an unfortunate misconception. Thanks to cooler temperatures, we’ve retained much of the natural snow that has fallen and ski areas have spared no expense utilizing modern snowmaking technology to pile the snow deep over the past few months,” stated Alice Pearce, Ski NH’s president. Vacation weeks allow families to enjoy time together and take advantage of the fun part of winter in New England. Ski areas realize that and offer a variety of activities to entertain everyone. Special events are scheduled through the week including fireworks displays, family ski races, après ski entertainment for adults and kids, and much more. For a complete list visit SkiNH.com. Among the offerings are Disney’s Get Out and Play with giveaways, games and more at Gunstock on February 18. King Pine at Purity Spring Resort will host Retro Day and a Scavenger Hunt on February 19. The Mountain Dew Vertical Challenge family-friendly race series visits Black Mountain, Crotched Mountain, and Mount Sunapee over the holiday break. Live music and auctions are part of the Childhood Cancer Lifeline Event at Pats Peak on February 25-26. New Hampshire’s ski areas also continue to offer a wide variety of year-round attractions for guests. Among the non-skiing activities offered are mountain coasters, zip line rides, canopy tours, giant swings, dog sled and sleigh rides, ice skating and much more. Although it may be considered a holiday period at resorts, many discount offers are still available. Ski NH’s Anywhere, Anytime Lift Ticket Packages offer $11-$21 off of holiday lift ticket rates, are valid anyday, and are fully-transferable so they can be shared with family and friends. Many ski areas also have daily lift ticket specials, discounts for buying online in advance, family deals and much more. Visit SkiNH.com for full details on all of these February vacation offers. Ski NH is the statewide association representing 38 alpine and cross country resorts and more than 200 lodging and guest service properties in New Hampshire. For more information on ski areas, lodging packages, and updated winter events at Ski NH resorts, call Ski NH at (800) 88-SKI-NH (800-887-5464) or visit the Ski NH website at http://www.SkiNH.com. 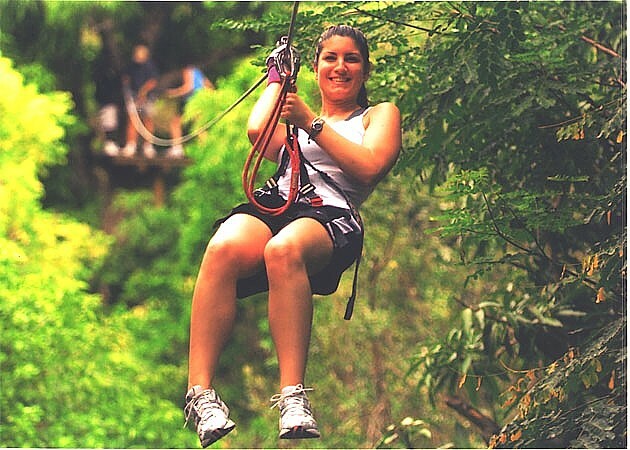 A zipline adventure at Treetops, on St Maarten. The island of St. Maarten (www.VacationStMaarten) has received the 2012 Editor-in-Chief Award from Porthole Cruise Magazine as the ‘Best Caribbean Shopping Experience’. The award is determined based on those in the cruise and travel industry that have “gone above and beyond in terms of service, quality, and excellence,” according to Bill Panoff, editor-in-chief, Porthole Cruise Magazine. Porthole Cruise Magazine, now in its 16th year and featuring a circulation of 500,000, is published bimonthly and offers cruise and destination related feature stories, as well as information on industry trends, ship reviews, destination features, and much more. The magazine recently formed a new partnership with World Travel Holdings, one of the nation’s biggest leisure travel companies. “We are honored to be chosen as the Best Caribbean Shopping Experience by Porthole Cruise Magazine,” said May-Ling Chun, interim Director of Tourism for the St. Maarten Tourist Bureau. “We truly offer something for everyone in terms of shopping trinkets and treasures and it is nice to be recognized for that by a leading publication in the cruise industry,” she added. St. Maarten’s capital, Philipsburg, is the epicenter for shopping with boutique stores lining Front Street, which stretches for over a mile. Shoppers will find that most prices are as much as 50% less than other countries and are quoted in U.S. dollars saving the confusion of sorting out the exchange rate. Along Front Street, stores range from Tiffany to Tommy Hilfiger. The Sint Rose Shopping Mall on the boardwalk by Front Street features Cartier, Lalique, and Faconnable. Old Street, situated off Front Street, is highlighted by 19th century houses which contain specialty shops. Maho Plaza (located by the Sonesta Maho Beach Resort) is another area for name-brand stores. “Whether travelers come for our beaches and spas or our cuisine and nightlife, one thing is certain – they never return home empty handed,” said Chun. St. Maarten offers great buys on jewelry, a perennial favorite among shoppers, with jewelers offering everything from loose stones to original designs. International fashion items such as Gucci and Ralph Lauren can be found at reasonable rates, as well as fine leather goods, top-of-the line cosmetics and state-of-the-art electronics. Art enthusiasts will delight in native prints and crafts pieces as well as works from artists all over the Caribbean. For more information on St. Maarten visit the official site of the St. Maarten Tourist Bureau at www.VacationStMaarten.com. St. Maarten is the smallest island in the world to be shared by two nations, Kingdom of the Netherlands and France, creating a European-influenced vibe with a Caribbean flair. As “the culinary capital of the Caribbean,” St. Maarten offers an eclectic array of cuisine for food lovers with more than 365 restaurants to satisfy the tastes of every palate and pocketbook. Located at the northern end of the Lesser Antilles, the island’s 37 square miles has 37 breathtaking beaches and is home to both historical and family-oriented attractions. During the day, watersport enthusiasts can enjoy the island’s scuba diving and snorkeling facilities while the capital of Philipsburg offers true duty-free shopping in a bustling Caribbean city atmosphere and 14 casinos and numerous nightclubs provide endless evening entertainment. Accommodations are varied and include elegant private villas, family oriented resorts, quaint cottages and luxury spa resorts. Air service to Princess Juliana International Airport is available from numerous U.S. and Canadian cities as well as from Europe, South America and the Caribbean. 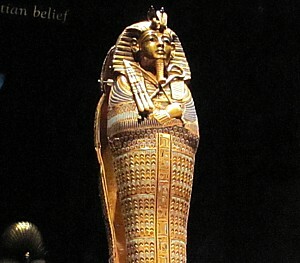 Tutankhamun: The Golden King and the Great Pharaohs” makes its last stop in the United States at Seattle’s Pacific Science Center before returning to Egypt. Over 100 artifacts are in the exhibit, including this coffinette for the Viscera of Tutankhamun © 2012 Karen Rubin/news-photos-features.com. Warwick Seattle Hotel is offering a special package for history buffs to unravel the past and unwind in the present. “Tutankhamun: The Golden King and the Great Pharaohs” makes its last stop in the United States at Seattle’s Pacific Science Center before returning to Egypt, and Warwick Seattle’s “Warwick King Tut Package” enables visitors to see it in style. The exclusive offering includes an overnight stay in an elegant Deluxe or Executive Room with a view of the world famous Space Needle or Emerald City skyline, complimentary Internet, roundtrip ‘chariot’ service between Warwick Seattle Hotel and Pacific Science Center, and two VIP tickets to the exhibition. The King Tut exhibition will be on display at Pacific Science Center from May 24, 2012 – January 6, 2013, but you don’t have to wait until May to purchase the “Warwick King Tut Package.” Available online starting February 16, the package is the perfect gift for the history buff in your family or for anyone who wants to add something special to a Seattle getaway. And with VIP access, you get the royal treatment with anytime entry into the exhibition and front-of-line access to avoid long waits. Pre-registration is also available by contacting the Reservations Office at 1-800-426-9280 or res.seattle@warwickhotels.com. As you discover the treasures of the past, Warwick Seattle also wants to ensure you will experience the comforts of the present. Recently completing its Phase II renovations, Warwick Seattle has now transformed two thirds of the hotel, encompassing 149 rooms on ten floors, with a host of stylish and sophisticated touches, and a comprehensive refurbishing of the corridors. The new look allows Warwick Seattle Hotel to combine a welcoming atmosphere with a more modern feel. “Tutankhamun: The Golden King and The Great Pharaohs” features more than 100 objects from King Tut’s tomb and ancient sites representing some of the most important rulers throughout 2,000 years of ancient Egyptian history. With more than twice the number of artifacts than the King Tut exhibit that toured in the 1970s, many of the jewelry, furniture and other priceless artifacts have never been seen in the United States before. The “Warwick King Tut Package” starts at $239. To book, visit Warwick Seattle’s website at www.warwickwa.com or call 800-426-9280 and ask for the rate code WKTUT. The package rate is based on double occupancy. Additional charges may apply if more than two adults occupy the room. Warwick International Hotels was founded in 1980 with the purchase of Warwick New York, a hotel originally built by William Randolph Hearst for his Hollywood friends. The WIH Group now includes 50 prestigious Hotels, Resorts & Spas worldwide located in city centres and resort destinations in the United States, Caribbean, Europe, Middle East, Africa, Southeast Asia, the South Pacific and Bali. More details are available at www.warwickhotels.com. Luxury Asia specialist, Pacific Delight Tours (www.PacificDelightTours.com), is poised to debut its first Myanmar program, a lavish 10-night foray into the exotic Southeast Asian nation formerly known as Burma. The tour journeys right to the intrigue of this exciting, emerging destination with a visit to the site where Siddhartha attained enlightenment as well as the famous Kyauktawgyi Paya Buddha, carved from a single block of marble. The program also features a relaxing cruise along the Irrawaddy River and a two-day sailing on Inle Lake. Covering the former capital of Yangon, ancient Bagan and the Mandalay Region, Pacific Delight’s new Myanmar Discovery program accomplishes precisely that which makes the tour company the leading, high-end operator to China and other parts of Asia – a seamless melding of cultural authenticity and extravagant luxury amenities starting from $4,299* per person, based on double occupancy, including international airfare. “There is growing interest in some of the less traveled regions of Southeast Asia with Myanmar in particular becoming a hot destination for 2012,” said Larry Kwan, president of Pacific Delight. “We’ve applied the same principles that made us successful in China to our Myanmar program, rounding out a comprehensive cultural program with relaxing cruises along scenic rivers and lakes and adding a touch of lavishness and sophistication for our discerning travelers,” Kwan noted. The program begins in Yangon, which in the local language means “End of Strife.” In addition to a tour of the National Museum to peruse its ancient artifacts and historic memorabilia, a highlight of the Yangon experience will undoubtedly be the Great Dragon Pagoda, considered one of the most sacred and impressive stupas in Myanmar, topped with a 76-carat diamond. Travelers will also visit Sule Pagoda, said to be built before the time of the Buddha more than 2,500 years ago. Located in Myanmar’s dry central plains on the eastern bank of the Irrawaddy River, sightseeing in Bagan begins at the temple ruins of the ornate golden 11th century Shwezigon Paya, which served as a prototype for later stupas and has played an important part in the relationship between traditional Burmese religion and Theravada Buddhism. Guests will continue on to visit other historical temples including the well-preserved Ananda Pahto southeast of Tharabar Gate, Gubyaukgyi Temple at Myinkaba, and Manuha Temple with its seated Buddhas. Traveler’s first day in Bagan culminates with a sunset visit to the Shwesandaw Paya, which is said to contain a couple of the Buddha’s hairs, followed by an insightful tour of a local lacquer ware workshop. Day two in Bagan begins with an extra special treat – Mahabodhi Temple. Also known as “Great Awakening Temple,” the Indian-inspired temple is believed to be the site where Siddhartha attained enlightenment. At Dhammayangyi Temple, built by King Narathu in the 12th century presumably to atone for his assassination of his father and eldest brother to ascend to the throne, the brickwork is said to rank among the finest in Bagan. Visitors will spend the rest of the day exploring the impressive paintings and carved stucco at Sulamani Temple, Nandamanny Temple and Thatbyinnyu Temple, before indulging in the local cuisine at a regional restaurant. Guests will begin their third and final day in Bagan observed by curious monkeys as they ascend a winding staircase toward Mount Popa to learn about Myanmar’s most important nats (spirits) and enjoy a spectacular view over the region. They will explore the local life in Salay and visit the Yoke-son Kyaung, a wooden monastery with beautiful carvings of court life and scenes from the Ramayana. They’ll wrap up the experience with a stroll around town, stopping at the local market and the Thar Ta Na Yaung Chi Monastery, which also serves as an orphanage. Next travelers will move on to Mandalay where they will begin with a tour of Mahamuni Paya, where worshipers flock to see the admired image of the Mahamuni Buddha covered in over 15 cm of gold leaves. Afterwards, the group will head to Shwenandaw Kyaung, built and carved entirely of golden teak wood, followed by Kyauktawgyi Paya, the famous monumental Buddha carved from a single block of marble, and Kuthodaw Paya, known as “the world’s biggest book,” with 729 Buddhist scriptures carved into slabs of marble. The second and last day in Mandalay will focus on the Irrawaddy River, along which passengers will encounter spectacular scenery including fishing villages and local wildlife as they sail to Mingun. Here they will explore the ruins of the vast Mingun Paya, a monument to human ambition commissioned by King Bodawpaya. Ironically, this monument was never finished due to a prophecy that the king would die upon its completion. Passengers will re-board their boat and sail towards Sagaing, a place for mediation and contemplation for many nuns and monks. Guests will observe the Pagoda of Many Elephants as well as other famous temples including Tupayon Paya, before continuing on to Amaprapura and the Mahagandayon Monastery to observe monks and novices as they line up to receive their daily offerings of alms and food from faithful Buddhists. The cruise culminates with a visit to the 19th century Pahtodawgyi Paya and the reconstructed Bagaya Kyaung, a wooden monastery founded by King Mindon, pausing along the way to enjoy a picturesque teak bridge extending more than 3,000 feet across Taungthaman Lake. Upon arrival in Heho, visitors will ride an air-conditioned motorcoach to Inle Lake to board a boat propelled by the indigenous Intha people in the traditional way – by using their legs to row. The lake’s shore and island consist of 17 Intha-inhabited villages on stilts, known for their magnificent floating gardens. Passengers can participate in excursions to Jumping Cat Monastery, Phaung Daw Oo Pagoda and Inn Paw Khon Village, where the local specialty is lotus and silk weaving. After a relaxing night on Inle Lake, travelers will begin their day at the hidden Indein Temple complex, consisting of hundreds of small stupas overgrown by moss and greens. They will continue on foot past rice fields to the village of Sae Ma to explore a local school, meet some indigenous natives and observe the daily activities of the local monks. Visitors will return to Yangon for one final activity-filled day. This will be the perfect time to browse local handicrafts at Bogyoke Aung San Scott’s Market, which contains over 2,000 vendors. Travelers will conclude their tour of Myanmar with a stroll around Kandawgyi Lake, enjoying the reflection of the Shwedagon Pagoda on its waters as they observe one last Myanmar sunset. For more information or to book, consult your local travel agent, contact Pacific Delight Tours at 800-221-7179 or visit www.PacificDelightTours.com. In celebration of 65 years of providing unique travel experiences, Trafalgar (www.trafalgar.com) is offering up to $1000 savings per couple on a majority of their air-inclusive 2012 European vacations. This limited-time Anniversary Sale counteracts the increasing flight costs set by the airlines and gives guests the opportunity to experience Europe as an insider without having to adjust their travel budget. These savings are valid on most of Trafalgar’s most popular European trips, including the 9-day Madrid, Seville and Barcelona itinerary heading to sunny Spain. This At Leisure getaway combines several included dining and sightseeing highlights with plenty of free time for guests to explore the cities on their own. In beautiful Seville, guests are introduced to Trafalgar’s unique Be My Guest dining experiences as they enjoy a delicious meal at an authentic Andalusian hacienda. Other highlights of the trip include hop-on/hop-off sightseeing in Barcelona and a fiery Flamenco show in Seville. Travelers can save up to $1,000 per couple ($500 per person) on new 2012 air-inclusive bookings only when booked and paid in full through March 30. Savings vary by itinerary length, departure date, destination and airline. The offer is not valid on itineraries heading to London, Edinburgh, Glasgow, Russia, Scandinavia and Eastern Mediterranean, and is subject to availability. Travelers also have the opportunity to win the Madrid, Seville and Barcelona trip for two, courtesy of Trafalgar and bestselling author Patricia Schultz. For more information and to enter to win this fantastic holiday, visit http://www.workman.com/1000places/events/. For more information and reservations, see your Travel Agent or call 866-544-4434 or visit www.trafalgar.com. Vacations By Rail is adding five new independent rail vacations, including Vienna-Salzburg-Munich. 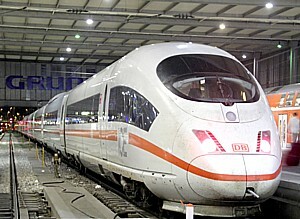 Here, a train at the Munich terminal © 2012 Karen Rubin/news-photos-features.com. Chicago-based specialty travel company Vacations By Rail’s European product line grows this year with the addition of five new independent rail vacations to some of Europe’s most popular cities. New packages include the following city combinations: Berlin-Prague-Vienna, Paris-French Riviera, Prague-Vienna-Budapest, Rome-Florence-Venice, and Vienna-Salzburg-Munich. Each European rail package includes centrally-located hotels with daily breakfast, city orientation tours, and first-class rail travel and seat reservations connecting each city. New European rail vacations start at $1,215 land-only, per person based on double occupancy. Detailed itineraries for these new packages as well as Vacations By Rail’s complete product line can be found at www.vacationsbyrail.com. Custom European rail vacations are also available upon request. To book a Vacations By Rail European train vacation, contact a rail specialist at 1-877-929-7245. Fantasy of Flight, Central Florida’s premier aviation attraction, is celebrating National Black History month this month in a memorable way by kicking off its Fourth Annual Legends & Legacies Symposium Series with a visit from famed World War II heroes, the Tuskegee Airmen, as well as a student essay contest honoring the aviators’ leadership, excellence, advocacy and determination. During this unforgettable, three-day limited engagement event called “They Dared to Fly,” the Tuskegee Airmen, the nation’s first African-American military aviators, will share their personal stories of what it was like to serve as a pilot in the military during segregated America. 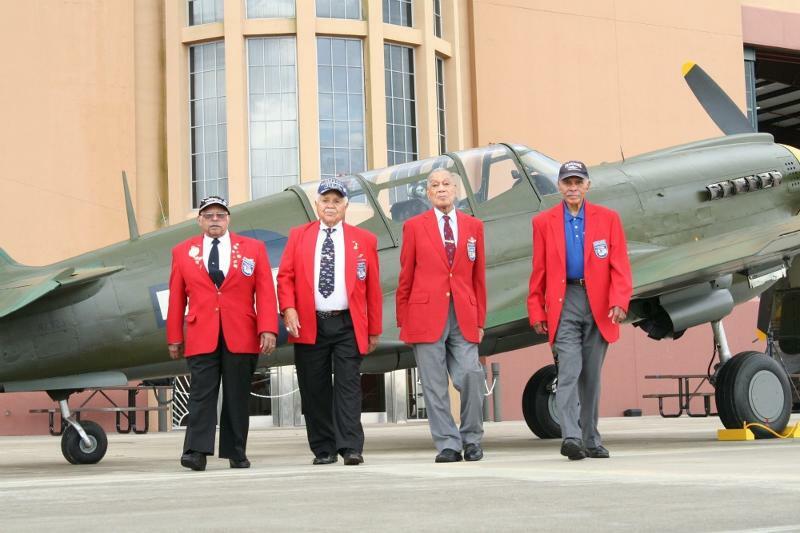 Three Tuskegee Airmen will be appearing including Leo Gray, 91, Ft. Lauderdale, who served as a consultant on the recently released Lucas “Red Tail” film, as well as Daniel Keel, 89, Leesburg and George Hardy, 88, Sarasota. Of the original group of nearly 1,000 trained pilots and 15,000 ground personnel that made up the Tuskegee Airmen, roughly 50 pilots and 200 ground crew are alive today. “They Dared to Fly” will be held Thurs., Feb. 9 through Sat., Feb. 11 and will feature two open-forum/question-and-answer sessions each day at 10:30 am and 2:30 pm followed by meet/greet autograph signings with several of the original Tuskegee Airmen. Symposium events are included in the attraction’s general admission price and are free for annual pass holders. In tribute to the Tuskegee, students in grades 4-12 are invited to participate in the “They Dared to Fly” essay contest. Using the principles of LEAD (leadership, excellence, advocacy and determination), students should describe how the Tuskegee Airmen achieved success or describe how they can use these values to achieve a personal goal of their own. Entries will be judged on overall content, including spelling, grammar, punctuation, legibility and penmanship (as applicable). Prizes will be awarded to the first, second and third place winners in each grade category (grades 4-5, 6-8 and 9-12). First place will be awarded $100; second place, $75 and third place, $50. Entries must be postmarked or hand delivered prior to 5 p.m. on or before February 20, 2012. Winners will be announced March 16, 2012. Additional rules apply; for more information, visit www.fantasyofflight.com. 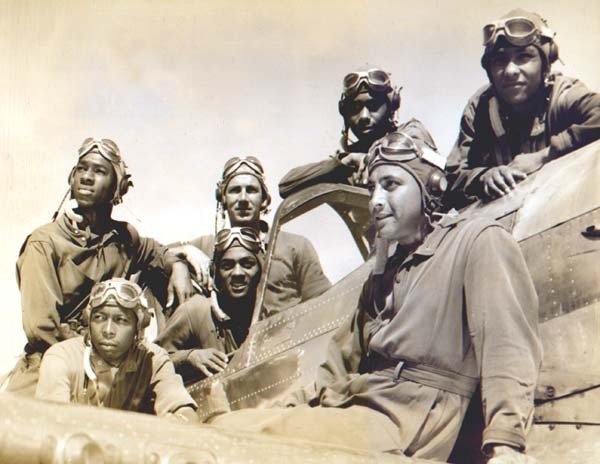 The deadline for the essay contest is Feb. 20, 2012 in order to allow students and student groups to attend the Tuskegee Airmen’s “They Dared to Fly” symposium Feb. 9-11 and write about what they have learned. Fantasy of Flight’s permanent multi-media Tuskegee Airmen exhibit and vintage aircraft collection, including the P-51C Mustang, provides the perfect backdrop for this once-in-a-lifetime opportunity to meet the brave men who fought America’s enemies abroad while enduring racism at home. The compelling and historically significant Fourth Annual Legends & Legacies Symposium Series brings to life the experiences of some of America’s most courageous aviators through permanent and semi-permanent exhibits, real aircraft, and most importantly, their own personal stories and interactions with guests. In addition, the series will include heroes from WWII and a newly created program reflecting on Vietnam. The six topics scheduled for 2012 include: “They Dared to Fly: Featuring the Tuskegee Airmen” in honor of National Black History Month, Feb. 9-11; “Breaking All Barriers: Amazing Women in American History,” in honor of National Women’s History Month, March 2-3; “Unspoken Valor: The Bomber Crews of World War II,” April 13-14; “D-Day: The Invasion of Normandy,” May 11-12; “Reflections of Vietnam,” June 8-9 and “Letters Home: Love, Courage & Survival,” Oct. 12-13. Symposium events are included in the price of Fantasy of Flight general admission and are free for annual pass holders. General admission is $28.95 for adults, $26.95 for seniors ages 55 and over and $14.95 for children, ages 6-12, plus 7 percent sales tax. Children five and under are free with full paying adult. Group rates are available for groups of 15 or more; for more information, call 863-984-3500, ext. 220. For general information, visit www.fantasyofflight.com. Fantasy of Flight is Central Florida’s premier aviation-themed attraction showcasing vintage aircraft from the world’s largest private collection; themed immersion experiences; interactive exhibits; a tram tour of aircraft maintenance areas; Restoration and Backlot tours; Fun with Flight center for families and the country’s only Aerial Demonstration of the Day (weather permitting) featuring a vintage plane. General admission also includes The Tuskegee Airmen – They Dared to Fly exhibit; the multimedia tribute to the WASP (Women Airforce Service Pilots) – A Passionate Pursuit, a walking audio tour and many special events throughout the year. New at Fantasy of Flight this year is Wing WalkAir, a thrilling outdoor attraction featuring a 600-foot zip line suspended four stories above water and a three-level ropes course complete with 33 midair challenges to be performed while tethered to an overhead line at heights of up to 45 feet. Ideal for families, couples, student/youth groups or corporate groups seeking teambuilding opportunities, Wing WalkAir is the first attraction of its kind in Polk County, located midway between Tampa and Orlando. Admission is $22 for the zip line and ropes course or $15 for the zip line and $12 for the ropes course when purchased separately. Group rates are available. Fantasy of Flight admission is not required for entry to Wing WalkAir. Hours are 10 a.m. – 5 p.m. daily. General admission is $28.95 for adults, $26.95 for seniors ages 55 and over and $14.95 for children, ages 6-12, plus 7 percent sales tax. Annual passes are available for $69.95 for adults, $39.95 for children ages 6-12, plus 7 percent sales tax, and are good for one year from the date of purchase. Biplane rides, through Waldo Wright’s Flying Service, and hot air balloon rides, are available for an extra charge. For more information about Fantasy of Flight, call 863-984-3500 or visit www.fantasyofflight.com.